Trust Your Gut. Is it Time For a Change? While trying to decide what I wanted to write about, I realized that tomorrow will be the one-year anniversary of my leaving a corporate job and going out on my own. What a perfect time for me to talk about trusting your gut and making bold changes. 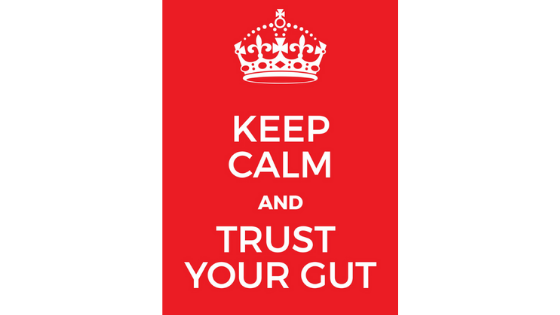 Gut feelings are the result of a lot of processing that happens in your brain. It constantly compares incoming information against previous experiences and predicts what will come next. When a mismatch occurs and something wasn’t predicted, your brain updates its models. Gut feelings occur when your brain has made a significant match or mismatch, but this has not yet reached your conscious awareness. What does all that mean? It means, it is more than just new age hooey, there is science happening here, and our guts and what they are telling us deserve more respect. Since college I have changed companies seven times. Normally, I stayed 3-4 years before moving on to greener fields, but the last job lasted over 10 years. In some cases I probably knew after a very short time, the job was not a good fit, but finances, a misplaced sense of loyalty, fear of being unemployed, etc., kept me in those positions longer than was good. My first job out of college was truly an example of how not to listen to your gut. Due to long hours and burnout, I left without another job lined up AND facing high unemployment in the U.S. About two months after my leaving, still with no job, the owners of the company called and offered me a promotion to come back. At the time I thought it would be great to get that $8,000 raise and more responsibility. I took that promotion and lasted 1 year before pulling up stakes once again and decamping. Fool me once, shame on you. Fool me twice, shame on me, right? What if I had listened to my gut and focused on changing things as soon as possible or not second-guessed my instincts? Would my career path have seemed less riddled with potholes and detours? I honestly don’t have any regrets. I learned a lot from my experiences, and needed that time to grow brave and finally trust what my gut was telling me. Like growing old, starting your own business is not for sissies, you need some major courage and trust in what your gut is telling you. What better opportunity exists to reveal exactly what you are made of and live your life on your terms? Need help with change? Let’s talk! We are SPEARity, a local Milwaukee leadership coaching firm that specializes in business coaching, executive coaching, and leadership development training.